Israeli soldiers killed, on Wednesday morning, a young Palestinian man, after shooting him with three live rounds from a very close range and prevented Palestinian medics from approaching him. 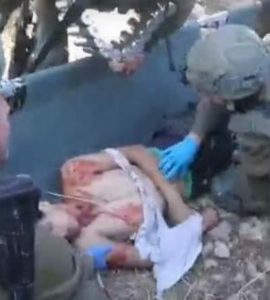 The Palestinian, identified as Ezzeddin Abdul-Hafith Tamimi, 21, was shot by soldiers, who were less than two meters away from him, and logged three live rounds in his neck. Palestinian medics were called to the scene, but the soldiers also attacked them, and preventing from approaching the seriously wounded young man, who succumbed to his injuries. Eyewitnesses said the soldiers assassinated the Palestinian, directly and repeatedly firing at him, in addition to attacking dozens of Palestinians. The soldiers also shot another Palestinian with a live round and caused many others to suffer the effects of teargas inhalation, during protests that took place after the soldiers killed Tamimi. The Palestinian worked as a car mechanic, and was chased and wanted by the army for 18 months, in which he managed to escape numerous attempts to arrest him. He was also shot and injured by Israeli army fire several times when the soldiers were trying to abduct him, and the army abducted his brother to pressure him into turning himself in to the army. A few weeks ago, the army called one of his brothers, and told him that “Ezzeddin will face the same fate of Ahmad Nasr Jarrar, who was killed by the soldiers on February 06, 2018, if he does not surrender. After the soldiers killed Ezzeddin, they invaded many homes, including his home, and occupied their rooftops. When Ezzeddin’s mother was informed that he was killed, she rushed to see him, but the soldiers sprayed her face with pepper-spray and forced her away. 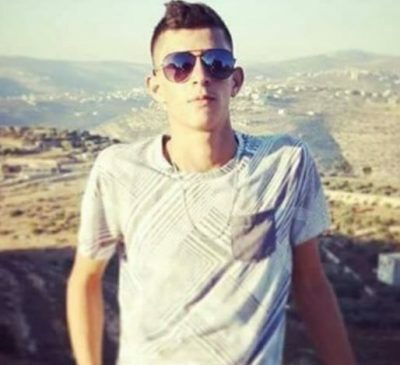 In addition, the soldiers invaded Beit Rima town, northwest of Ramallah, shot a young man with a rubber-coated steel bullet in his leg, and abducted Adli Farah Rimawi, from his home. The soldiers searched and ransacked many homes in the town, causing excessive damage, and closed many roads in its neighborhoods, in addition to sealing roads leading to surrounding villages and towns. Earlier Wednesday, the soldiers abducted at least twelve Palestinians, including Adli in Beit Rima, and injured many others during massive invasions targeting homes and communities, in several parts of the occupied West Bank, including Jerusalem.